Loviisa is a municipality and town of inhabitants on the southern coast of Finland. Kick off your visit on the 21st (Wed): pause for some serene contemplation at Loviisan kirkko, contemplate the long history of The Runeberg Home, appreciate the extensive heritage of Castle Hill, then take in the spiritual surroundings of Cathedral of Porvoo, then revel in the low prices at Brunberg Candy Factory Shop, and finally don't miss a visit to Porvoo Old Town. 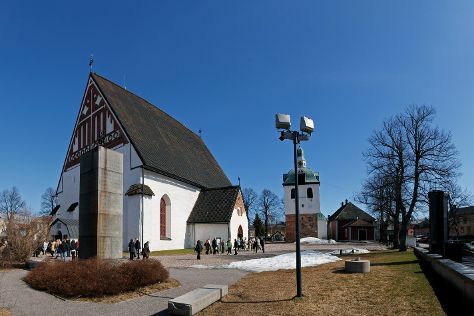 Here are some ideas for day two: stop by Riimikko, get a taste of the local shopping with Nasin Kartanon Galleria, then tour the pleasant surroundings at Fredrika Runebergs Park, then see the interesting displays at Porvoo Museum/Holm House, and finally take in the spiritual surroundings of Orthodox Church Porvoo. To see reviews, ratings, maps, and tourist information, go to the Loviisa day trip website . London, UK to Loviisa is an approximately 8.5-hour flight. You can also drive. The time zone difference when traveling from London to Loviisa is 2 hours. August in Loviisa sees daily highs of 23°C and lows of 13°C at night. Finish your sightseeing early on the 22nd (Thu) so you can travel to Helsinki. Get some historical perspective at Sea Fortress Suomenlinna and Uspenskin Cathedral (Uspenskin Katedraali). Appreciate the collections at Seurasaari Island and Open-Air Museum and National Museum of Finland. Get out of town with these interesting Helsinki side-trips: Espoo (Nuuksio National Park, Arctic Expedition, & more), Sipoonkorven Kansallispuisto (in Vantaa) and Tuusulanjarvi (Lake Tuusula) (in Tuusula). Pack the 31st (Sat) with family-friendly diversions at Linnanmaki Amusement Park. Next up on the itinerary: take in the spiritual surroundings of Rock Church, stroll through The Esplanadi Park, pause for some serene contemplation at Helsinki Cathedral, and find your balance on the water with some of the best stand-up paddleboarding in the area. For other places to visit, ratings, traveler tips, and other tourist information, use the Helsinki journey planner . You can drive from Loviisa to Helsinki in 1.5 hours. In August in Helsinki, expect temperatures between 24°C during the day and 13°C at night. Wrap up your sightseeing on the 4th (Wed) early enough to travel back home.